We’ve seen our share of teachers in the movies, but we never see them as teachers. We see them as great orators, stand-up comedians or wise counselors, but we never see them doing the actual nitty gritty of teaching grammar or times tables. 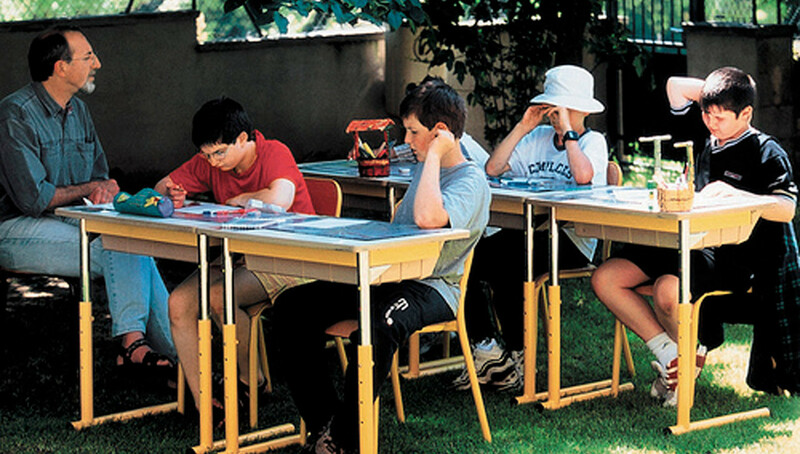 The French documentary “To Be and To Have” is simply about teaching and learning. Filmmaker Nicholas Philibert trains his camera on one classroom in a small school somewhere in the French countryside for a semester, and he finds spellbinding drama there. “To Be and To Have” gets inside the lives of its young characters so deeply and so empathetically that every tiny academic setback feels like a tragedy to us, and every small step forward feels like a triumph. “To Be and To Have” was released in 2004, and played in Madison for a week at the Orpheum Theatre. (Parts of this post are taken from my original review.) I never forgot it, and, a decade later, as I put the new DVD edition of the film from Kino Lorber in, the rush of emotion I felt back then came flooding back. I suddenly felt a desperate need to find out where these kids were today, how were they doing, were they all right. The dozen or so students in the schoolhouse range in ages from 4 to 12 or so, and although some of them conform to certain types – there’s shy Nathalie, or bullying Oliver, or irrepressible JoJo – Philibert’s camera brings us up so close that we can see through the stereotypes. The camera isn’t sitting at the front of the classroom, it’s right next to them to hear every whispered aside, to see every expression on their faces. There’s a wonderful scene where a student swipes a young girl’s eraser, and as her faces changes from shock to outrage to sadness and bewilderment, you can’t help but share every emotion with her, even over something as meaningless as an eraser. There’s also humor here, too, as when an entire family gathers around their son doing a math problem, arguing over how it should be done. The real hero of the film, however, is the teacher, Georges Lopez, who has been teaching at the school for 20 years. With his university professor goatee and stern gaze, Lopez at first seems like a strict taskmaster, such as when he gently admonishes a preschooler for saying “vet” instead of “veterinarian.” A preschooler! But we quickly understand that Lopez is a great teacher in every sense of the word, drawing from infinite reserves of patience and respect as he instructs his pupils, never raising his voice, never talking down to even the youngest student. He may not be a touchy-feely kind of person (he seems a little awkward when he tries to physically comfort a crying Nathalie), but his teaching is simply one of the purest expressions of love I’ve ever seen on film. It’s hard not to be moved when Lopez explains to his students midway through the film that he’s planning to retire after next year. And the final shot of Lopez, alone in his classroom after the last day of school, is heart-wrenching in a way that only real life can be. Philibert includes a lot of gorgeous shots of the rolling French countryside throughout the film as winter turns to spring and summer, but these scenes aren’t just postcards. Instead, they sort of clue us in to the gentle, swaying rhythms of the film. The one real extra on the DVD is an interview with Philibert, conducted around the time of the film’s release. He explains the process of finding just the right schoolhouse he wanted — apparently, the kind of small-town schools that Lopez teaches in are vanishing in France, making way for the kind of larger, centralized schools that most American children are familiar with. Philibert originally intended to make “To Be and to Have” as an argument in favor of small-town schools, but he thankfully keeps his agenda entirely off screen. As a beautiful celebration of community and humanity, it needs no context. I can’t think of a better film than “To Be and To Have” that illustrates what makes the classroom such a sacred space, and how the bond between teacher and parent can last only nine months, and endure forever.